David Iglesias is the prototype twenty first century Republican: charismatic, Hispanic, an evangelical Christian and a captain in the Navy Reserve who served for many years in the Navy’s Judge Advocate General Corps (“JAG”). In 1998, Iglesias campaigned to become Attorney General of New Mexico against the heavily favored Patricia Madrid. He nearly pulled off an upset and the Republican Party took notice. In 2000, Iglesias paid his party dues and worked for George W. Bush’s election. 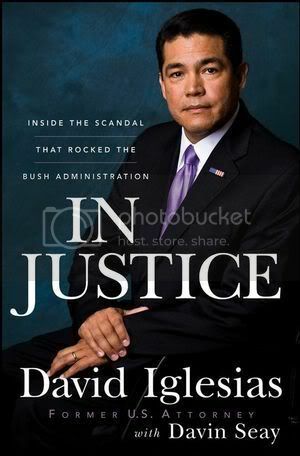 As a reward, President Bush nominated Iglesias in 2001 to be the United States Attorney from the District of New Mexico. His sponsor was longtime Republican Senator Pete Domenici. The position of U.S. Attorney has served as a springboard for many political careers and Iglesias appeared to be on the fast track. Highly regarded by his peers, Iglesias served as chairman of a committee of U.S. Attorneys that advised former Attorney General John Ashcroft about border and Immigration issues. The Justice Department had also given his office high marks for performance. The federal investigation into the firing of nine U.S. attorneys could jolt the political landscape ahead of the November elections, according to several people close to the inquiry. Notable is how involved and engaged several of the fired U.S. Attorneys are in the ongoing investigations. Iglesias, Bogden, Cummins, and McKay are quoted in the article as participating in various aspects of the many inquiries.